I didn’t know anything about Doctor Who when I started watching Russell T Davies’ modern version of the series, and more so than maybe any other TV show I’ve ever watched, it felt like one where anything could happen. One week the Doctor might travel five billion years into the future to watch the Earth explode. The next he’s in Victorian England fighting ghosts with Charles Dickens. I eventually got a sense for the structural beats and parameters of the series, but that “anything can happen” feeling returned in season five when new showrunner Steven Moffat lightly rebooted the show’s world. Eras of Doctor Who may be marked by the ever-changing face of its alien protagonist, but the biggest shifts happen when a new creative force takes over behind the scenes, which is a much rarer occurrence. 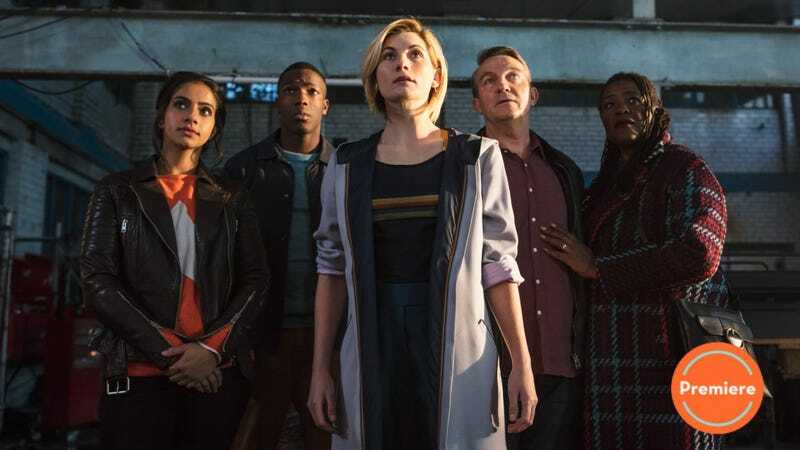 The much-hyped global premiere of Doctor Who’s 11th season doesn’t just introduce a new Doctor and her new companions, it also introduces the creative voice of Broadchurch creator Chris Chibnall in his role as Doctor Who showrunner. Both new fans and returning ones are in the same place I was when I first started watching Doctor Who all those years ago: The rules haven’t yet been written and just about anything can happen. For the first time in a long time, Doctor Who has no set template to work from. Like watching a trapeze artist perform without a net, it’s both thrilling and slightly terrifying to watch Doctor Who launch itself into this brand new era. And that feeling, more than anything, is what will define my memory of this exhilarating premiere. As an episode rather than just an experience, however, I would call “The Woman Who Fell To Earth” a strong but not flawless launch for this new era of Doctor Who. And that’s okay! Post-regeneration episodes are always a slightly strange beast, particularly ones that start with an entirely clean slate as this one does. For a post-regeneration episode to instill some confidence in me, it doesn’t have to be totally flawless, it just has to provide four things: A Doctor who still feels like the Doctor; companions I immediately care about; a cool bit of action; and at least one moment or idea that feels like it could only exist in Doctor Who. “The Woman Who Fell To Earth” ticks all of those boxes and then some, so even if it’s not quite as strong as Moffat’s all-time great debut episode “The Eleventh Hour,” it still has me incredibly excited to see what comes next. First things first, I’m happy to report that the Doctor definitely still feels like the Doctor. She’s a bit manic, a bit impulsive, a bit weird, and above all deeply, deeply caring. Jodie Whittaker is utterly delightful in the role, and particularly for those who know her from her more grounded work on Broadchuch (or even her more grounded performance in the sci-fi cult classic Attack The Block), it’s a whole lot of fun to watch her cut loose in an entirely different way. She hilariously captures the mixture of “I can do anything!” and “I have no idea what I’m doing!” that generally defines the Doctor immediately post-regeneration. Whittaker definitely has some moments in this premiere that are stronger than others, which makes me suspect that—like David Tennant and Peter Capaldi—it might take her just a bit of time to fully settle into the role. (I also think her comedic timing is occasionally hampered by the editing, which isn’t quite as sharp as it could be.) Overall, however, Whittaker’s a huge success in her first outing as the Doctor. As it always, it will be fun to analyze the ways in which this Doctor echoes her predecessors (right now she seems to share a lot of qualities with both the Tenth and Eleventh Doctors). But what interests me even more are the moments in which this Doctor feels wholly unique. When she and her companions stumble upon a dead body and one of them offers to get something to cover it, the Doctor quietly responds, “Thank you, Grace.” In just three words we learn so much about who this Doctor is and what she prioritizes. She’s deeply respectful of the sanctity of life—not just in the epic, superhero-like way that all Doctors are, but also on the smallest level of giving someone dignity in death. She’s also the kind of person who immediately learns her allies’ names and thinks to thank them for their contributions, which hasn’t always been true of previous Doctors. In fact, this is a Doctor who has immediate faith in other people. “Don’t care how, use your initiative,” she says in one of several moments in which she gives a new ally a task and then relies on them to figure out how to do it. Previous eras of the show have sometimes demonstrated the Doctor’s alien-ness by making him dismissive, egotistical, or even callous. I love that this Doctor is still recognizably alien, but far more defined by her trust and empathy. Her first priority is saving the Earth, but once that’s done, she’s equally focused on making sure her new friend is okay when his dad disappoints him. Though “The Woman Who Fell To Earth” isn’t the flashiest episode in the world, it’s full of smart, subtle character choices that make me really optimistic about Chibnall’s abilities as a showrunner. That’s especially true of the way he introduces his companions. Aimless 19-year-old Ryan Sinclair (Tosin Cole), bright young policewoman Yasmin “Yaz” Khan (Mandip Gill), and timid former bus driver Graham O’Brien (Bradley Walsh) each offer a different worldview, a different set of skills, and a different reason for wanting to travel with the Doctor if/when she takes them on as full-time companions. Yaz is looking to challenge herself, Ryan is looking for purpose, and Graham is battling survivor’s guilt. The latter two men are also linked by a mutual desire to live up to the legacy of Ryan’s grandma/Graham’s wife Grace (Sharon D. Clarke), a brave nurse who joins the pantheon of great companions-who-might-have-been. With a larger-than-usual TARDIS team (or non-TARDIS team as the case may be), Chibnall smartly gives his three companions emotional links to one another but also plenty of room for their relationship dynamics to grow. It remains to be seen whether Grace’s death will bring Ryan and his step-grandad Graham closer together or drive them further apart (Graham and Grace were only married for three years so his relationship with Ryan is still very much in flux). Meanwhile, as old primary school friends who haven’t seen each other in a while, Ryan and Yaz have a built-in sense of trust and camaraderie, but also plenty left to learn about each other. As in most Doctor Who post-regeneration episodes, plot takes a backseat in “The Woman Who Fell To Earth.” The central alien mystery isn’t all that engaging, and the episode is occasionally bogged down by some choppy editing. I did enjoy the twist wherein the Doctor thinks she’s stumbled upon an intergalactic war being waged in Sheffield only to discover she’s actually dealing with a single alien hunter looking for a single human trophy. That being said, I don’t think tooth-collecting Stenza hunter “Tim Shaw” is going to rank near the top of a list of Doctor Who’s most memorable elements. But the episode’s crane-set action climax just might. As with the scenes set on the gorgeous green hills of Sheffield, director Jamie Childs takes great advantage of unique locations to make a familiar Doctor Who scenario feel entirely new. (It helps that this is also the first season of Doctor Who shot using anamorphic lenses, which gives the whole thing a more cinematic flair.) When Matt Smith delivered his iconic “I’m the Doctor” speech in “The Eleventh Hour,” it was on a generic hospital rooftop. Whittaker gets to deliver hers while standing on a crane arm thousands of feet off the ground. There’s this moment when you’re sure you’re about to die. And then you’re born. It’s terrifying. Right now I’m a stranger to myself. There’s echoes of who I was and a sort of call towards who I am. And I have to hone my nerve and trust all these new instincts—shape myself towards them. I’ll be fine, in the end. Hopefully. I have to be. Because you guys need help and if there’s one thing I’m certain of—when people need help, I never refuse. She then goes on to build her own sonic screwdriver (sonic Swiss Army knife?) out of old spoons, spare bits of alien tech, and a deconstructed circuit board. It’s Whittaker’s best scene, and it simultaneously feels like Doctor Who as we’ve always known it and Doctor Who as we’ve never seen it before. As the Doctor herself puts it, “Right, this is gonna be fun.” I couldn’t agree more. Welcome back to Doctor Who coverage! If you’re new to Doctor Who and curious to learn more, you can check out my guide to the modern era of the show right here. I’m also always happy to chat about Doctor Who on Twitter. Especially considering how much the latter portion of Moffat’s tenure normalized the idea of Time Lords changing both gender and race when they regenerate, I’m really glad “The Woman Who Fell To Earth” treats the Doctor’s new gender so matter-of-factly. Also, she might not have bought women’s clothes in a while, but her new outfit rocks. Sharon D. Clarke, who plays the doomed Grace, was originally announced as a “returning role” on this season. I’m not sure if that was a fake-out to avoid spoiling the premiere or if she’ll be back (maybe in flashback? maybe from the dead?) later this season. Ryan has a development coordination disorder called dyspraxia, which makes it hard for him to do certain physical tasks, like riding a bike. It remains to be seen how well the show will handle that moving forward, but it’s always nice to see more disability representation onscreen. Also in case Ryan’s burgeoning YouTube career becomes a big plot point this season, let it be known he starts this premiere with 37 subscribers. “Hello Ryan’s nan!” I very much like all three of our new companions, but I absolutely love Yaz.